PJ and I had a great trip to Italy. We spent five days in Rome, so there’s a lot for me to write about! 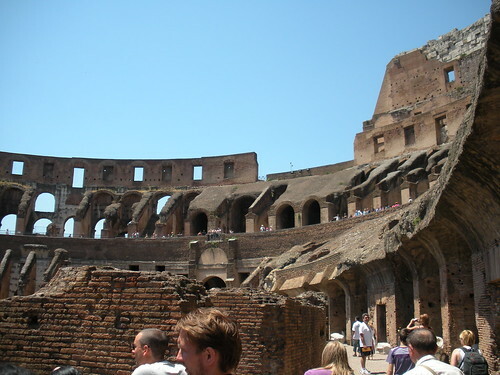 One of the first things we did was visit the Colosseum, the Forum, and Palatine Hill. After we checked into our hotel and showered, we decided to take the metro over to the Colosseum. 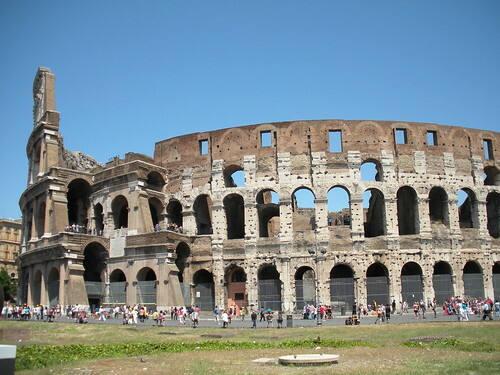 We initially thought that we would eat lunch somewhere in the vicinity and then visit the Colosseum. 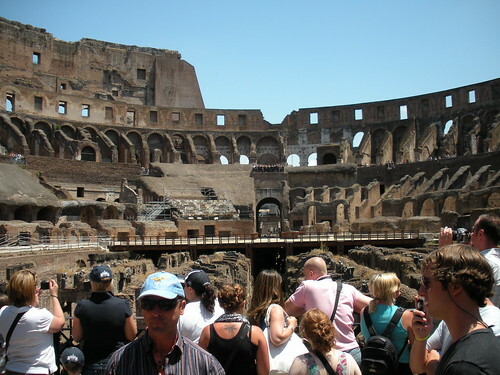 After leaving the metro station and as we walked toward the Colosseum, we were approached by the agents for a tour of the Colosseum. They mentioned that the tour would begin in about five minutes, so we decided to go ahead and join the tour. 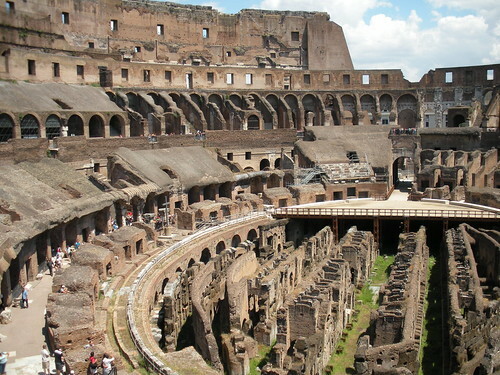 The Colosseum is a first century amphitheater used for gladiator contests. Max emphasized how expensive these contests were. For example, bringing the millions of exotic animals from around the known world to be slaughtered in the Colosseum alone was staggeringly expensive. Of course, lots of men died in the Colosseum as well, though, as Max explained, contrary to popular assumptions only two of these were Christians — executions of Christians for entertainment purposes took place at the Circus Maximus rather than at the Colosseum. Max also told us about the subsequent history of the building and the various uses and abuses of it in the past thousand years. Even with the initial wait, the tour, which lasted about 45 minutes, was well worth the price and I would definitely recommend it. 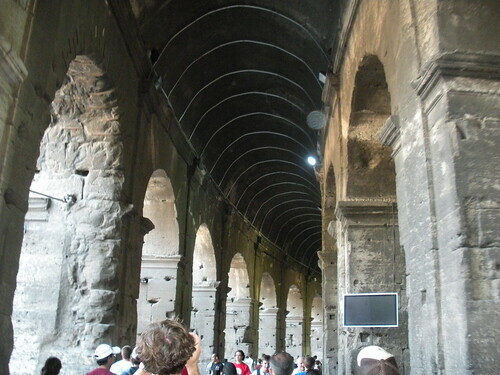 The basement, if you will, of the Colosseum. 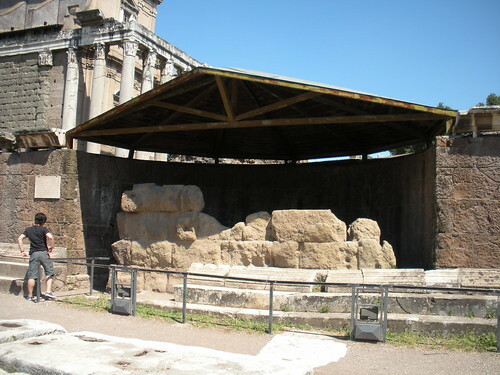 This area was once covered by the floor of the arena on which the men and animals fought. This area underneath housed the animals and served as storage areas. 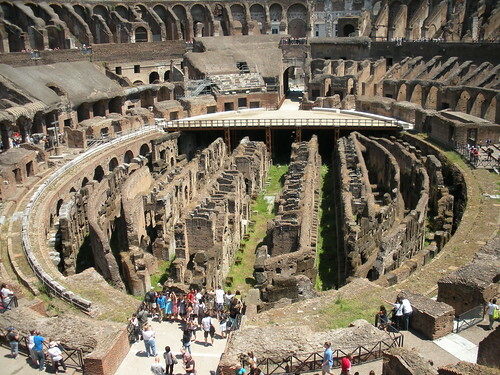 The upper decks of the Colosseum. After we saw the Colosseum, we had a quick pizza lunch at a sidewalk place across the street (next to the metro exit). It was nothing special, but we were starved so we didn’t mind. 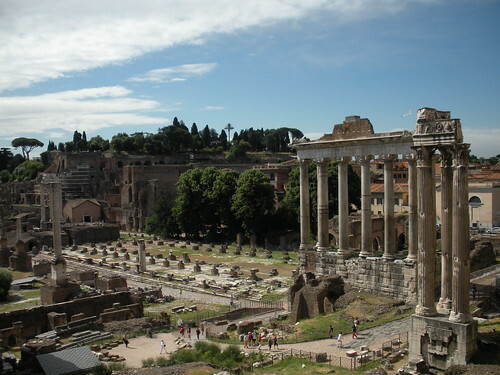 Then we walked over the Palatine Hill and the Forum. We could have taken another tour of these areas, but we decided to just wander around on our own. Consequently, I don’t have a lot of information to pass along, but I did enjoy seeing these ancient sites. 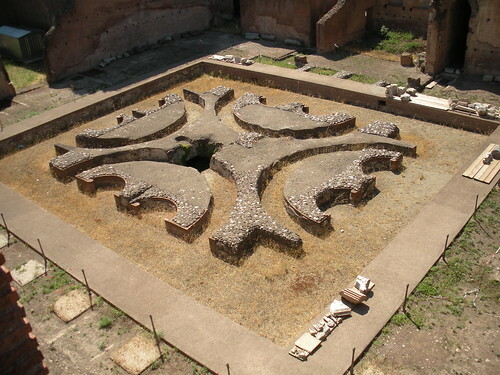 This is all that remains of the palace belonging to the infamous Emperor Caligula. 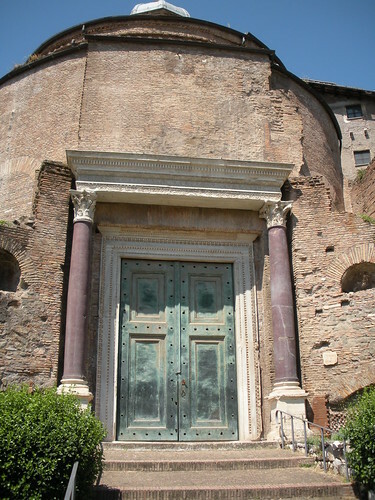 The Temple of Julius Caesar, where his body was cremated after his assassination. 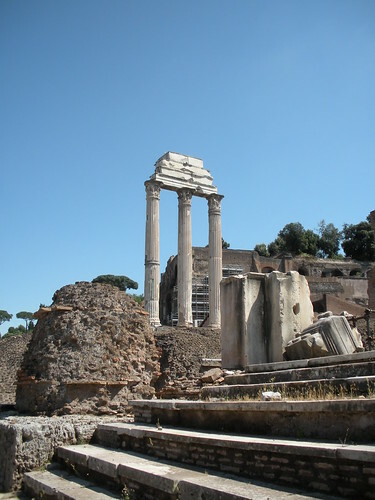 This is the Temple of Romulus. I really liked the doors. 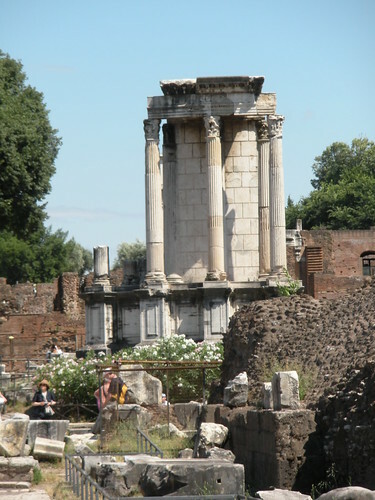 This is what remains of the Temple of Vesta, where the Vestal Virgins "worked." If they remained virgins for 30 years, they were rewarded with a husband and a stipend to live on. If they didn't, they were executed. 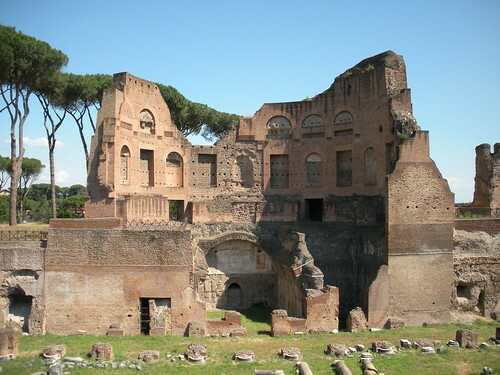 Palatine Hill is one of the seven hills of Rome. It became the site of an imperial complex, which is still being excavated. Here are some of the pictures I took of the palace site. 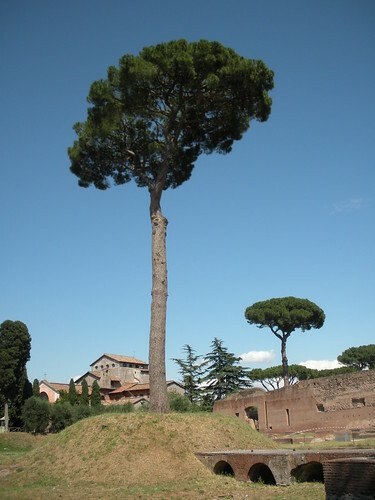 Palatine Hill has several umbrella pines, which I thought were lovely. I think this was part of the imperial dining room. 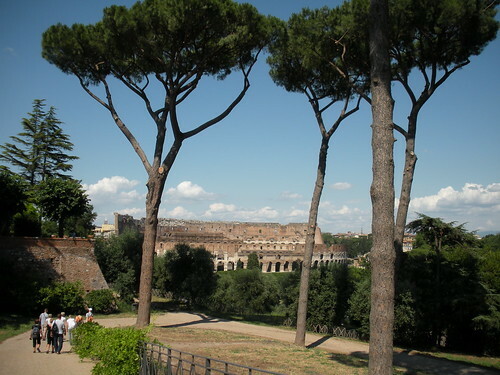 A view of the Colosseum through the umbrella pines from Palatine Hill. 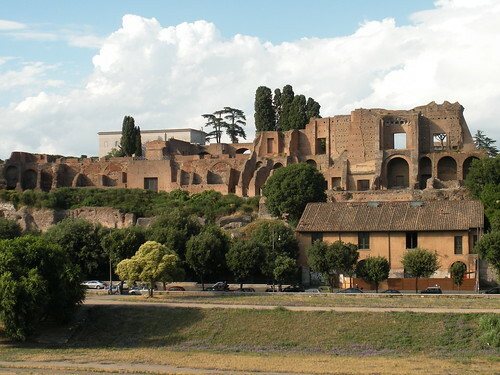 A view of Palatine Hill from the Circus Maximus side. 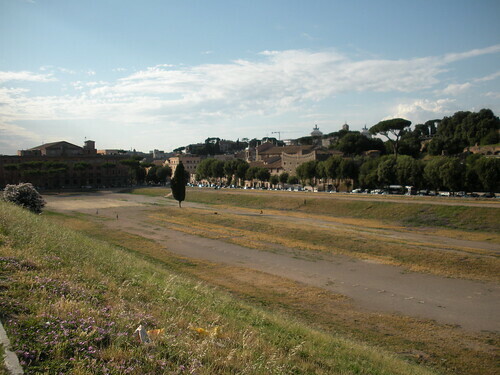 This is where the Circus Maximus was. 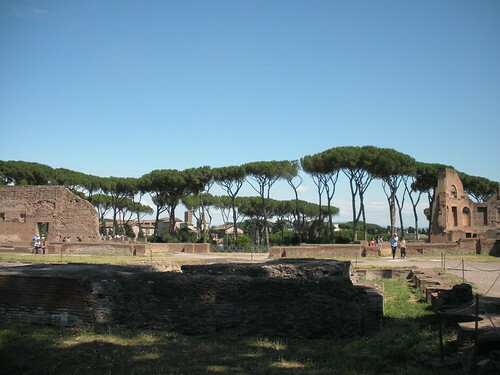 The Circus Maximus was mainly known for chariot racing, but it also featured mass executions. I’ll try to blog more about Rome and the rest of our trip as soon as I can.